Landscape architects point to this accessory as the number one outdoor design element this year. A custom granite fire table designed by Falmouth-based Bernice Wahler anchors an intimate brick patio that spills off the enclosed porch of this West Hyannis Port home designed by Boston-based architect Patrick Ahearn. “We wanted to create an element that would draw people outdoors from the living room, where the homeowners entertain,” Wahler says. She aimed for maximum impact and scaled the piece, which incorporates a 60-inch natural-gas fire element and a wind-defying glass enclosure, to relate to the architecture. The fire table stretches the full width of the bricks, as do the granite steps off the porch, providing extra space for seating and drinks. Even though our summer season is short, New Englanders have embraced the concept of outdoor rooms, raising the bar with comfy seating, weatherproof rugs, and even artwork on their patios. 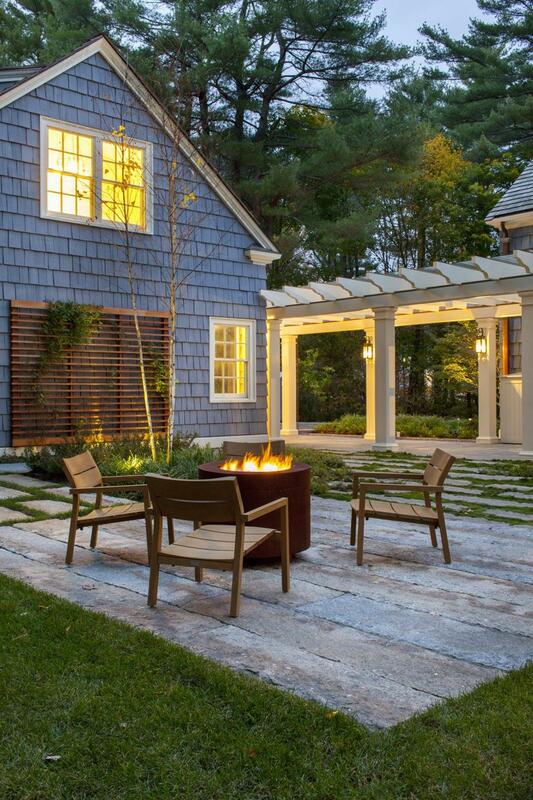 Another California-born trend has recently made its way east: the fire pit. 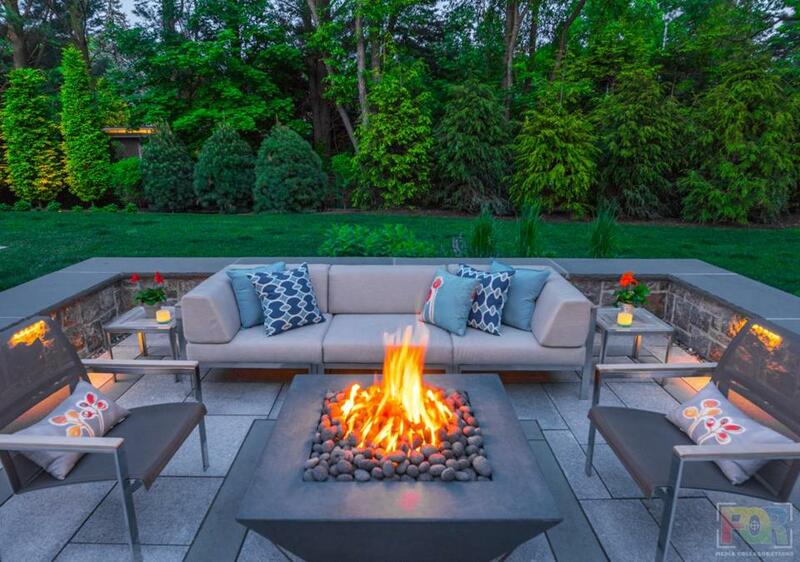 Designers and retailers report that homeowners are using fire-pit setups to extend the outdoor season in both early spring and late fall. A fire pit provides a focal point, as a complement to a pool or outdoor kitchen or as a gathering place for socializing or relaxing. Beyond backyards, fire features are popular with urban apartment dwellers, says Emily Arnow, an editor at Boston-based online retailer AllModern.com. 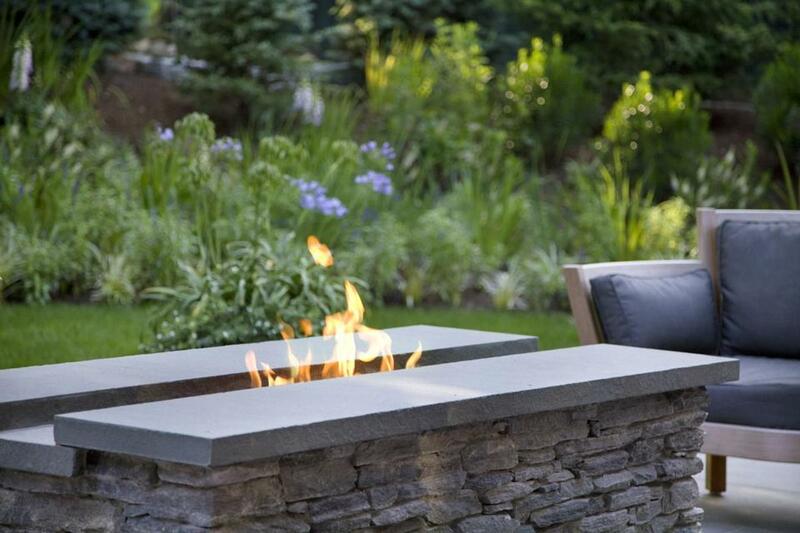 In the last two years, 31 percent of landscaping projects in urban areas incorporated a fire pit, compared to 35 percent and 40 percent in suburban and rural locales, respectively, according to a study by Houzz.com. “This means that fire pits in every size, shape, and price point have come on the market,” says Arnow. For example, AllModern.com offers 150 contemporary-style fire pits, with prices ranging from just under $70 for a portable wood-burning model to nearly $1,600 for a propane-fueled concrete model available in four colors. The whimsical yard on a bustling street contains not just lovely flowers but a spectacle in green glass. Hila Roberts, who is a patio buyer at Home Depot, reports a rise in sales of larger-scale fire pits, such as the 34-inch-wide wood-burning Tipton from Hampton Bay ($129). The Hampton Bay Cross Ridge gas fire table ($199) is also popular. 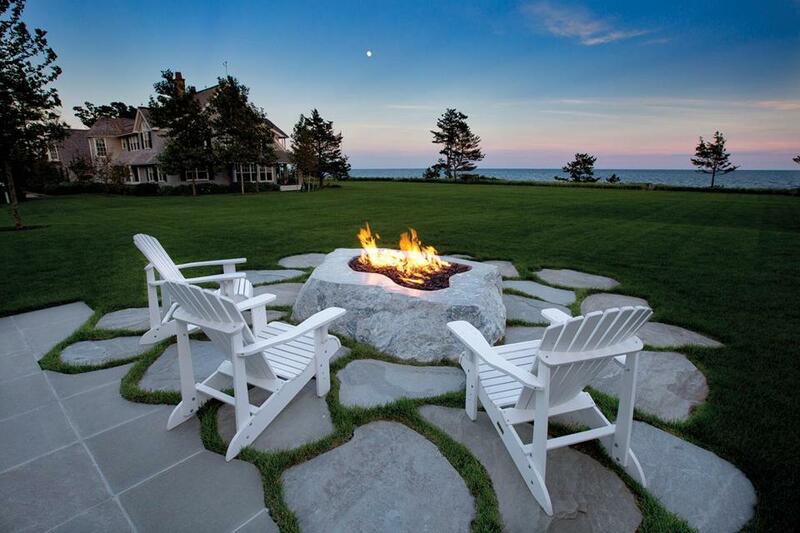 Determined to commission a unique design for their Osterville compound, Cambridge-based landscape architect Rick Lamb’s clients sought out Jeff Gammelin of Freshwater Stone in Orland, Maine, to fashion a fire pit from a schist boulder. Lamb and David Schumacher, of West Bridgewater-based Schumacher Cos., spent a day scouting a quarry at Duck Cove in Maine for just the right rock. “We chose this one for its jade green color,” Schumacher says. Gammelin sliced and hollowed it, then polished the top to a high shine to reflect flames. The vessel sits on pieces of tumbled bluestone that meander toward Nantucket Sound. 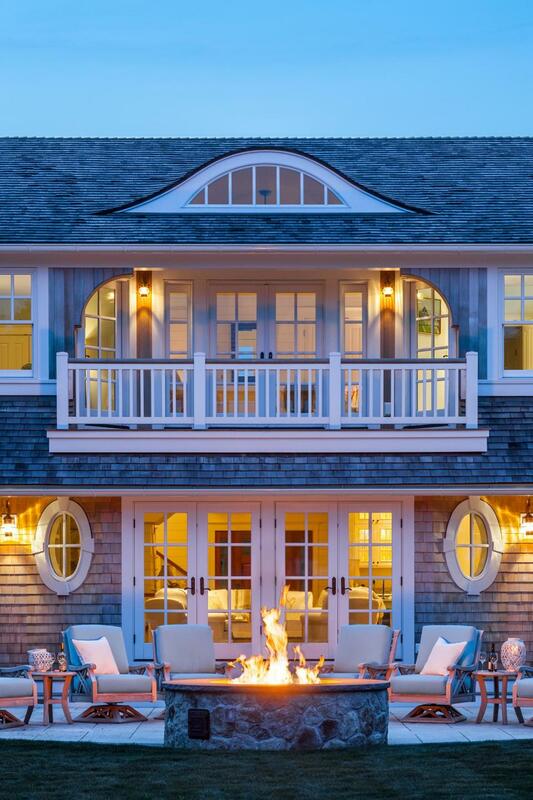 Sharon DaSilva of East Harwich-based Polhemus Savery DaSilva Architects Builders says the classic principles of design dictated the formal style of this Chatham waterfront arrangement. “It’s all very symmetrical and centered on the main entry,” says DaSilva. The fire feature, positioned at the pinnacle of the patio’s arc, can be seen all the way through the house. It’s also visible from the second-story bedrooms that open onto the balcony. Like the home’s fireplaces and chimney, the fire pit, which is 6½ feet in diameter, has a Southeastern Massachusetts split-face stone veneer. The bluestone cap has a textured surface that lends a rustic feel. 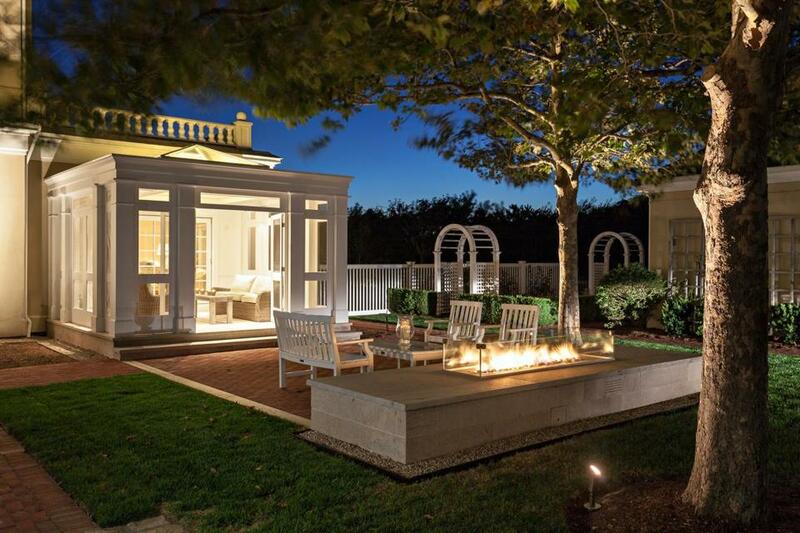 Landscape architect Kate Kennen of Charlestown’s Offshoots collaborated with Dedham-based interior designer Christine Tuttle to create a fire feature based on one the Wellesley homeowner had seen in San Francisco. The linear design echoes the indoor fireplace. The materials are indigenous to New England, which the environmentally conscious Kennen prefers. The stacked-stone base has a flat bluestone top that doubles as a coffee table. “I always design with cocktail hour in mind,” says Tuttle. A Vogue article featuring Kelly and Calvin Klein’s Hamptons spread inspired her to pair charcoal cushions with mahogany Weatherend furniture from Maine.